Address Sign Sticks To Side of Mailbox - - the perfect size address sign designed to fit on the side of your post-mounted curbside mailbox. Easy to read 3" numbers are sure to put a smile on your mail carrier's face. Made in USA. Custom made sign for a home or business mailbox. Personalized with the address numbers and/or letters you specify and the color combination you select. Made from sturdy and UV-stabilized laminated, non-rusting acrylic with engraved personalization. Available in three lengths: 4", 6", and 8". All signs are 4" high. 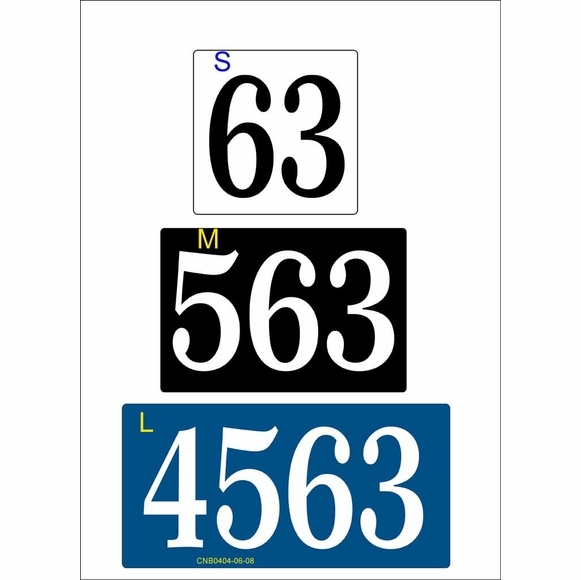 Each size sign holds a different number of characters, which may determine which size you should order. Please also measure the flat portion on the sides of your mailbox to make sure it is big enough for the size sign you need. The smallest sign at 4"L x 4"H x 1/8" holds up to two (2) 3" characters. The medium sign at 6"L x 4"H x 1/8" holds up to three (3) 3" characters. The large sign at 8"L x 4"H x 1/8" holds up to four (4) 3" characters. Comes with exterior quality double-sided tape for simple installation on the sides of your mailbox. No holes to drill or hardware required. Curbside Mailbox Address Sign the perfect size address sign designed to fit on the side of your curbside mailbox. Simple installation with double-sided tape (included). Made in USA.